About ten years ago, Carol and I took the trip of a lifetime. We went to Europe to visit Richie who was going to grad school in Germany and to do some hiking. It was a wonderful trip. We saw so many amazing things, and hiked, and biked, and hiked some more. 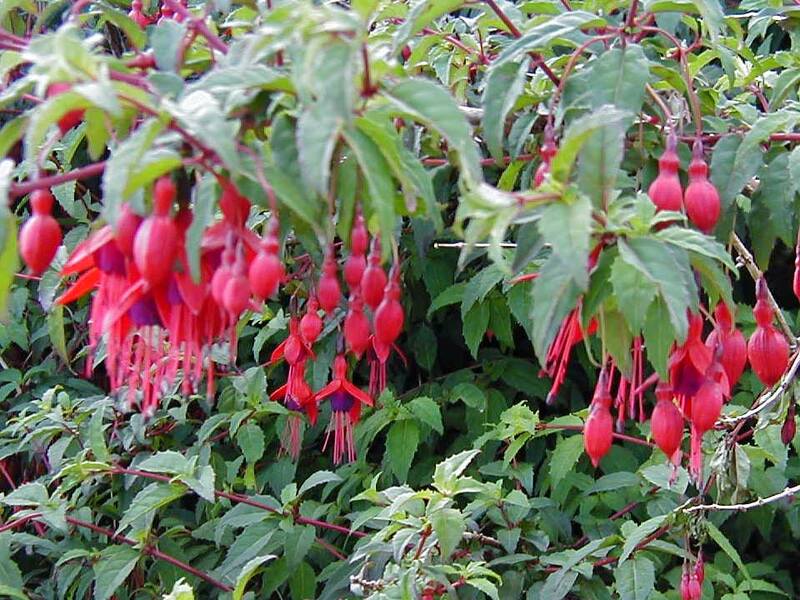 Then we flew to Galway, Ireland, and rode bicycles across the green countryside along streets lined with fuscia walls. 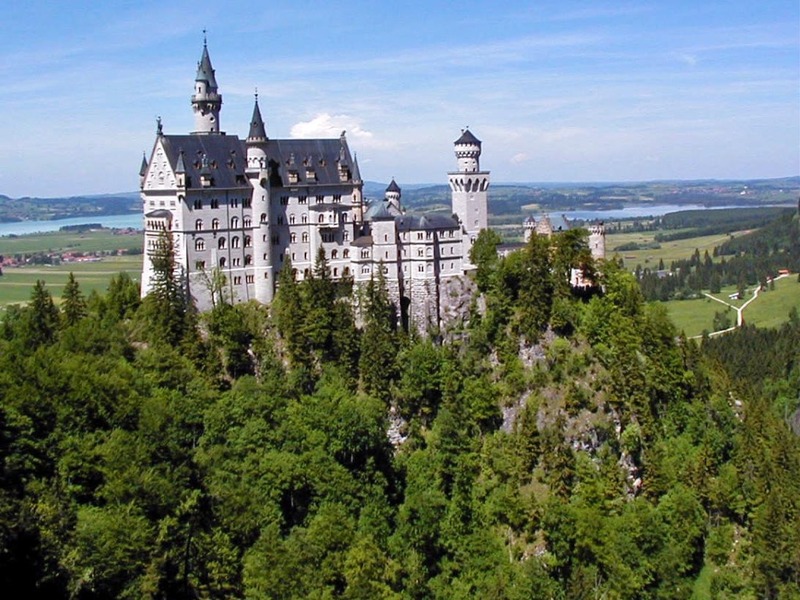 Richie went back to school and Carol and I flew to Munich, Germany, and hiked along Mad King Ludwig’s Trail to Castle Neuschwanstein. 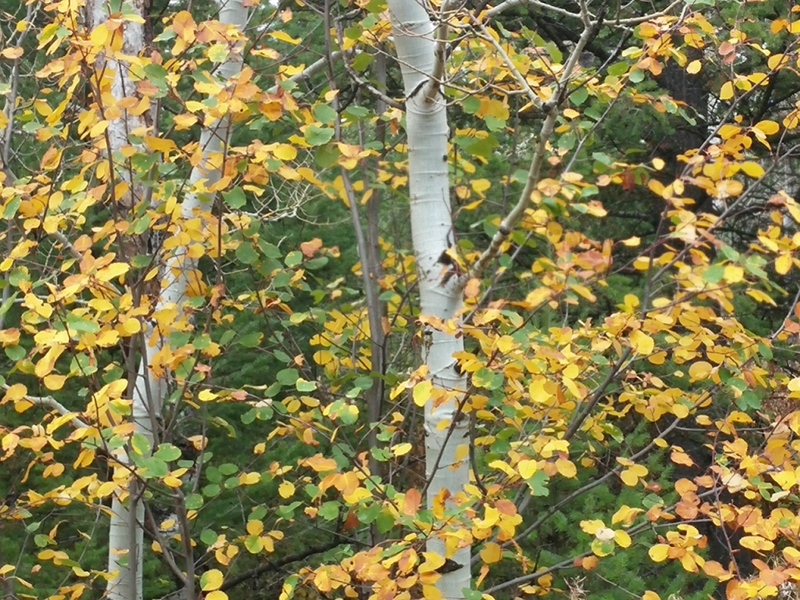 We were hiking between eight and twelve miles or bicycling between 20 and 30 miles each day. We ate yogurt and fruit for breakfast, made a sandwich for lunch, and had a candy bar for dinner. When Rich and I travel, he does ALL the worrying. I’m footloose and fancy free to enjoy everything. When Carol and I travel, I assume Rich’s job and do it quite well. While Carol was having a blast, I was obsessing about each little thing that could go wrong. Between that and being terribly homesick, I couldn’t wait to get home. I didn’t tell Carol how miserable I was until many years after our trip. Now I’m counting sleeps for a different reason although it still involves Carol. 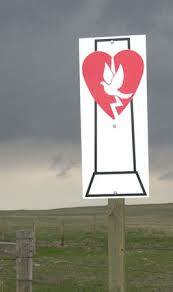 In five more sleeps we are meeting in Las Vegas to play at a pickleball tournament for the Nevada Senior Games. Well, really we are meeting to visit. It’s been way too long since we’ve had a twins retreat. 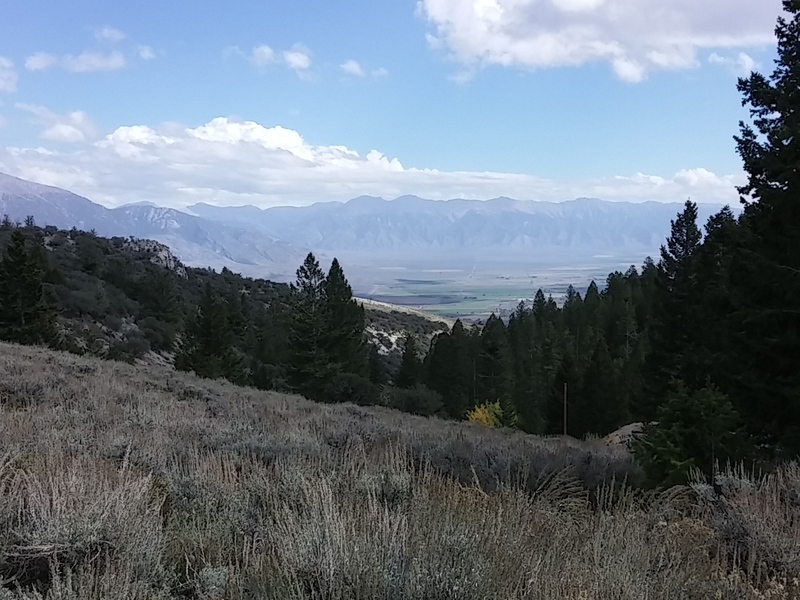 During our drives around Arco, we saw some amazing scenery. 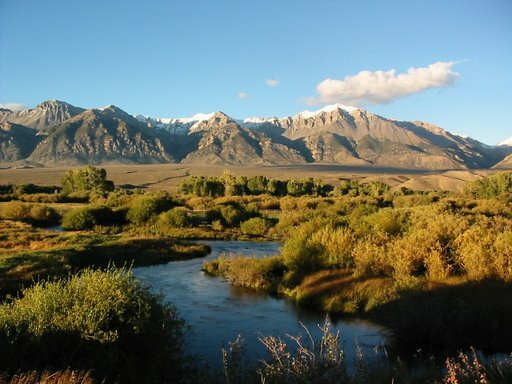 The Big Lost River is a large river that basically gets lost. 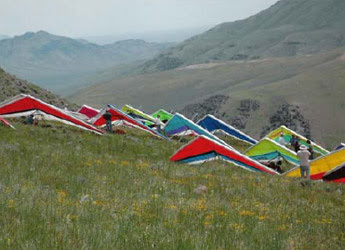 It starts in the Pioneer Mountains, a subrange of the Rockies. It is 135 miles long, and its surface flow does not reach any other river. 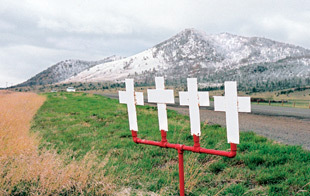 It disappears from the ground and vanishes into the Snake River Aquifer. 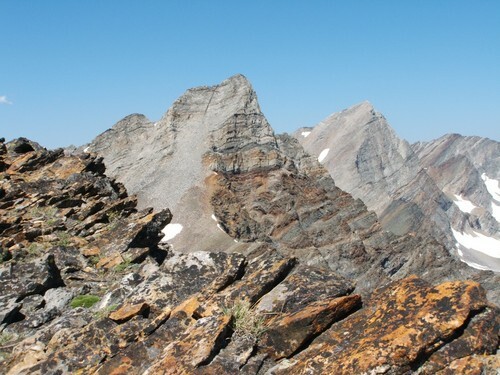 Borah Peak, the highest in Idaho, tops out at almost 13,000 feet. The mountain range is long and has many valleys. Here is someone else’s photo of the Upper Pasherimoi Valley. Awesome. 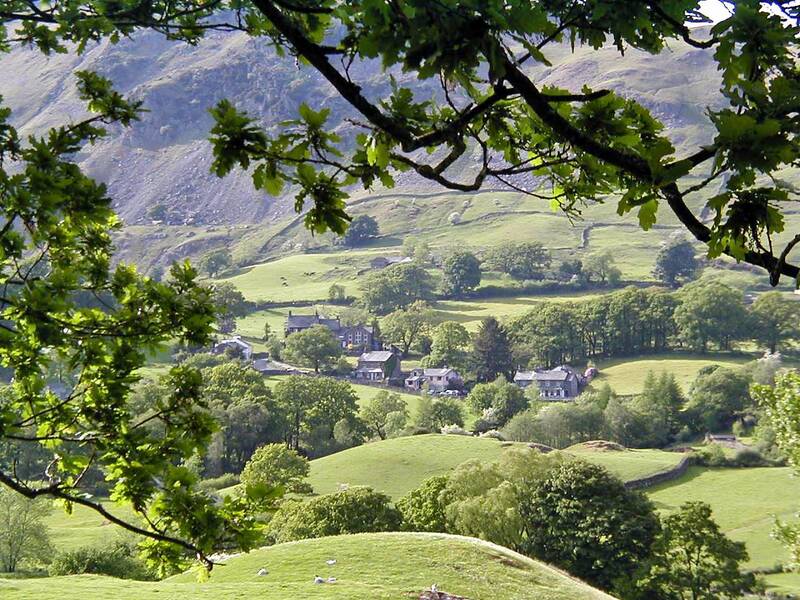 The valley is home to multiple farms and ranches. It’s at about 5000 feet in elevation, so we guessed that the alfalfa tests high for protein content because of the shorter growing season. This is one area I’d love to come back to to explore some more. We drove to Boise yesterday. We haven’t seen Melissa for almost three months. Way too long. She and I ran towards one another for the perfect hug. What makes a hug perfect? 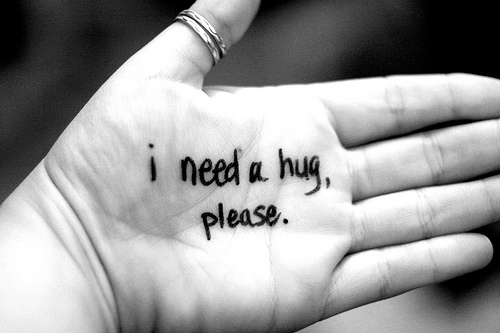 While I was searching for the perfect image to use in this post, I came across an article entitled The Eightfold Path to a Truly Great Hug by Bryan Reeves that perfectly explained how to hug, step by step. Hug like you mean it. 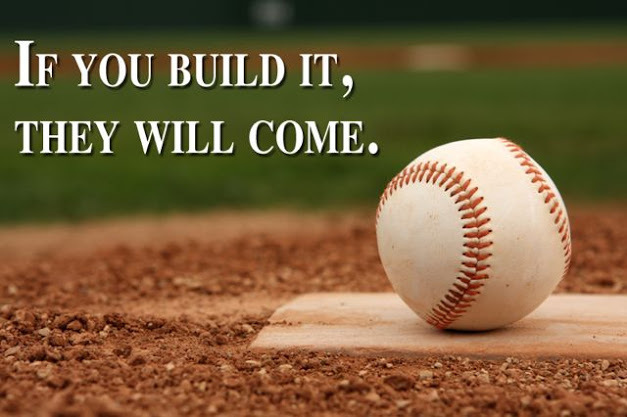 Be willing to be vulnerable. Open your arms. Just be with the person you’re embracing. Misslissa and I did everything right except we added something all the way through number three and number eight. Yesterday we did some exploring around Arco. 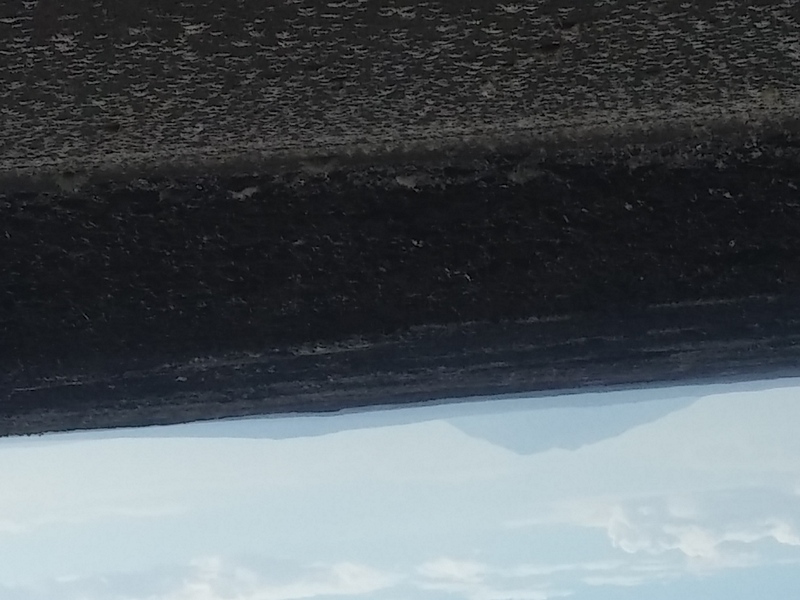 First stop was Craters of the Moon National Monument and Preserve. We’ve been living in Idaho over eight years, and we’ve never been to see them. 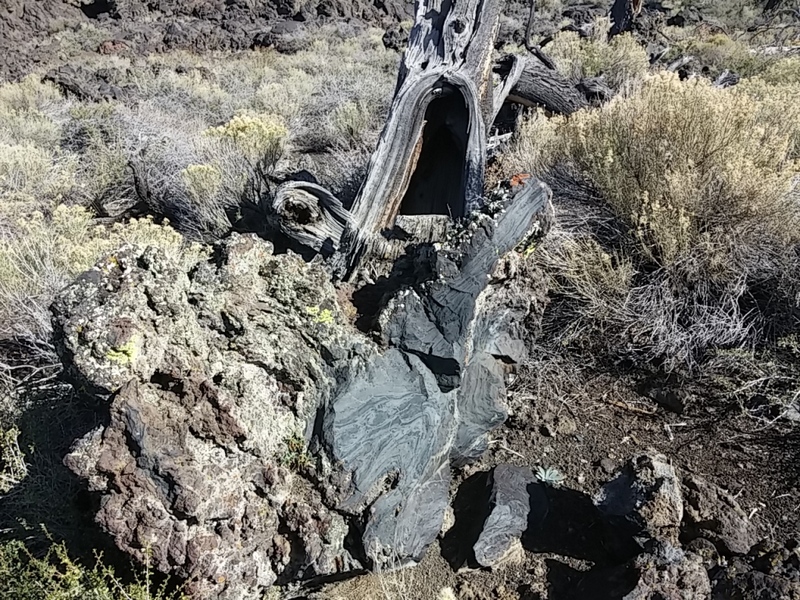 There are three major lava fields and sagebrush grasslands that encompass over 1100 square miles. 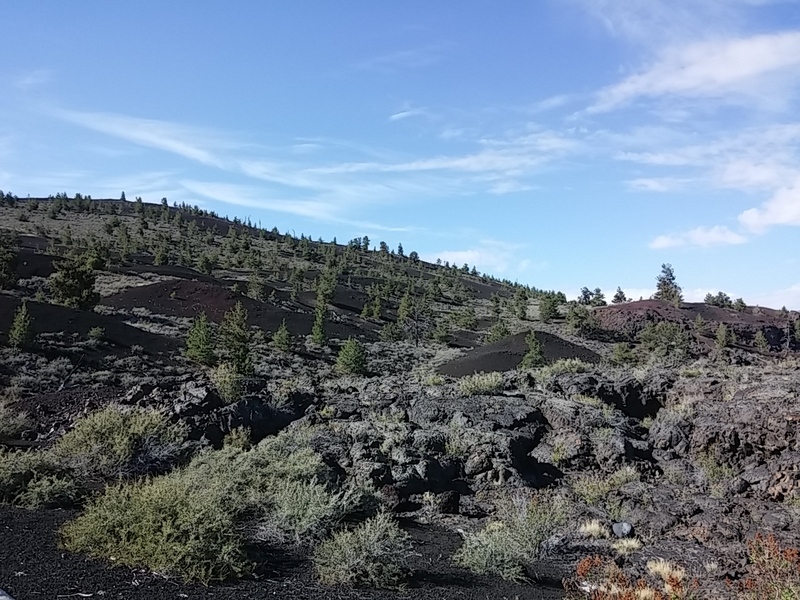 The lava fields lie along the Great Rift of Idaho–a line of cones and lava vents within the park. This rift is considered to be the latest, deepest, and most recent in the continental US. 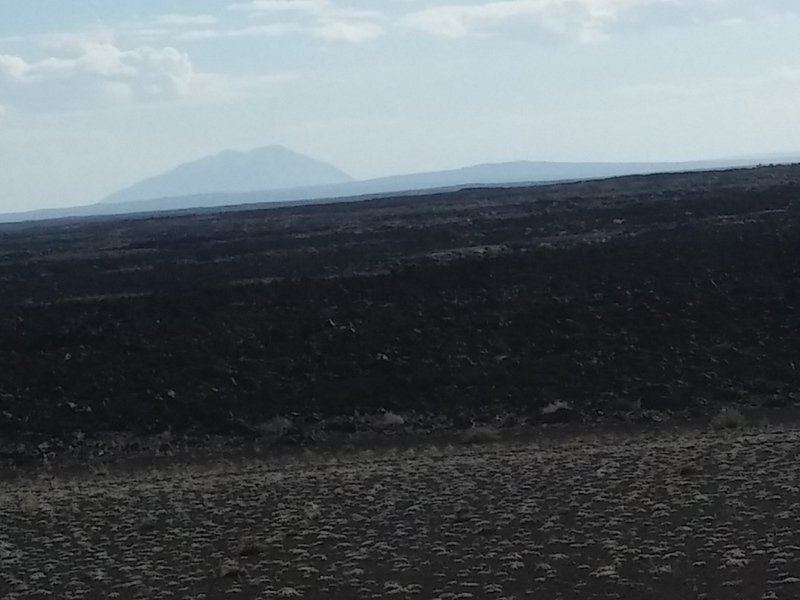 Some of the rift cracks are the deepest on earth at 800 feet deep. I won’t claim to completely understand what all that means, but I did learn lots at the visitor center. 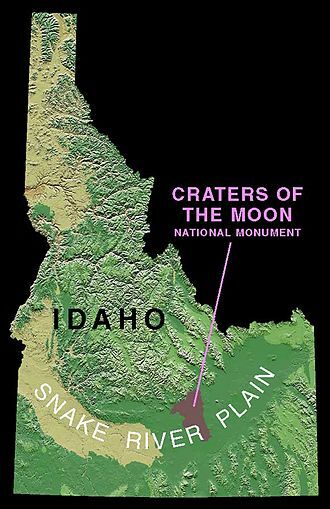 There are a series of calderas (think holes left after a volcanic eruption) that run along the Snake River Plain and on up into Yellowstone that have shaped the area and are expected to be active again within a couple hundred thousand years. We were amazed at the diversity of the rocks and the vegetation in the park. 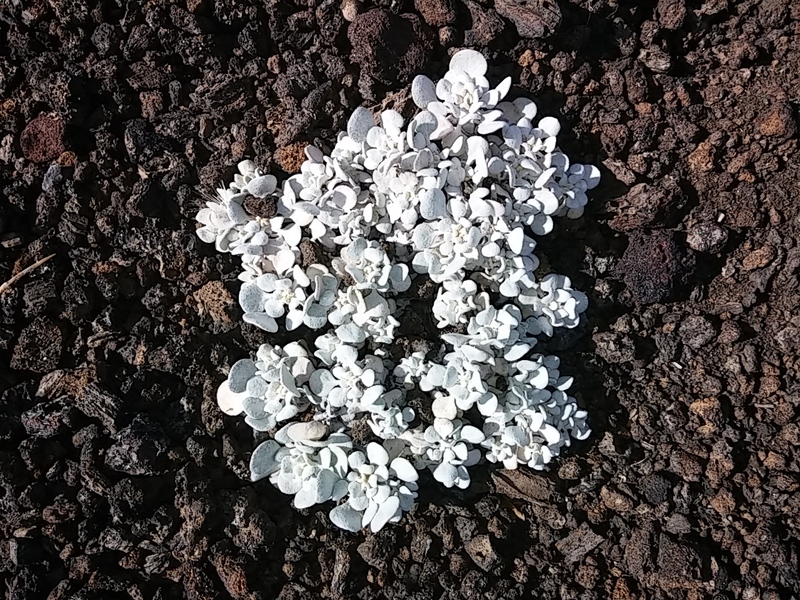 This small grey plant looks pretty against the black volcanic rock. Many of the rocks are covered with colorful lichen. I’m so glad we visited the park. It’s stunningly surreal. It’s always fascinating for me to find out more about places, especially when I didn’t think there was much to find out. 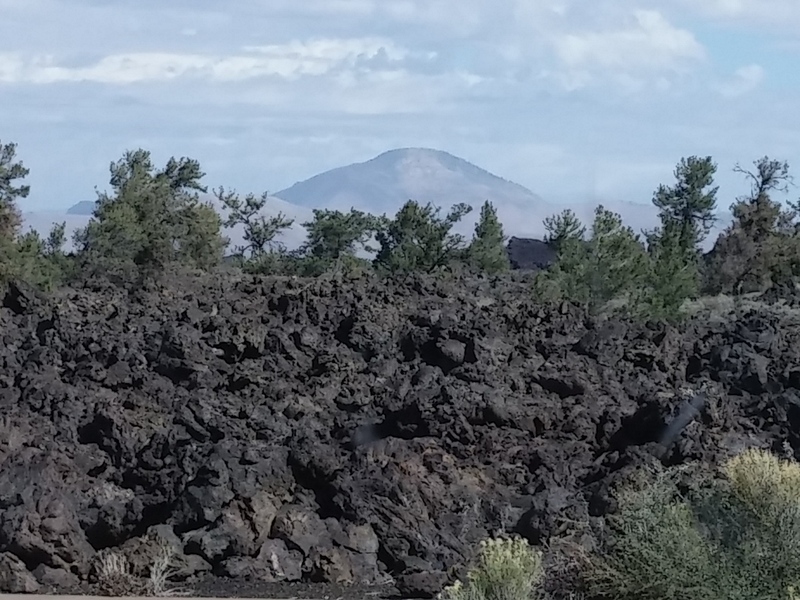 We’re in Arco for two nights to take a look at the Craters of the Moon National Monument. More about the Craters tomorrow. 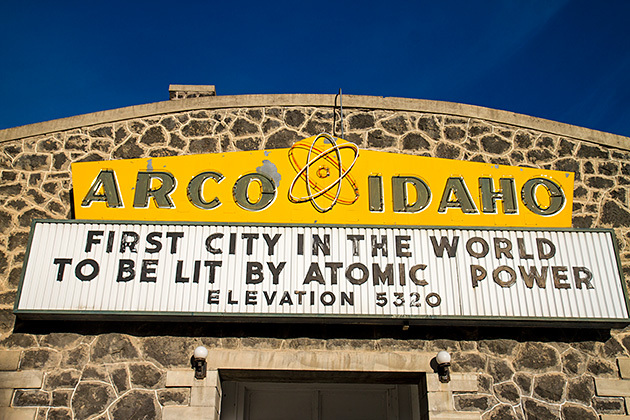 Turns out that Arco was the first city in the world to be powered by nuclear reactor in 1955. The Idaho National Laboratory, a federal research facility, resides on 890 square miles between Arco and Idaho Falls; it employs over 4000 people. Throughout its lifetime, over 50 one-of-a-kind nuclear reactors have been built and tested at the site. While the INL employs many people, very few actually live in Arco. Arco’s population has steadily declined from a high of 1562 in 1960 to its current population of 995. It’s really easy to see why this area was chosen. 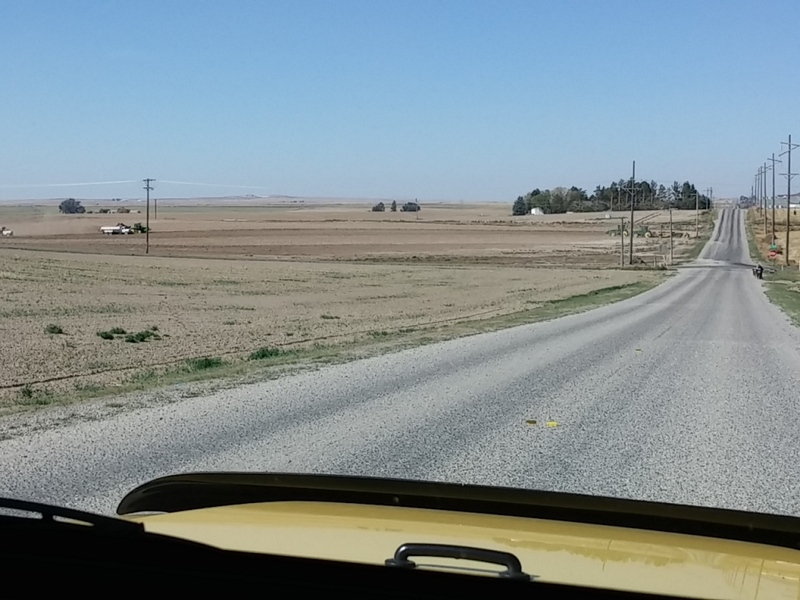 It’s barren for as far as the eye can see… It actually looks a lot like parts of Nevada. 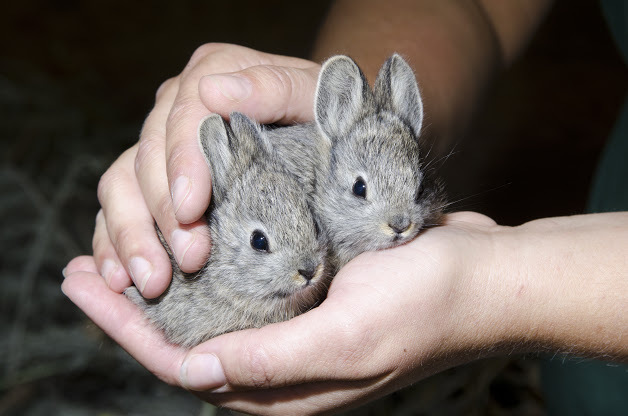 We never did see the one local animal I really wanted to see: Pygmy Rabbits. 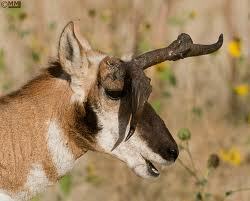 They are native to the Great Basin and weigh just under a pound. My goodness, they are cute! Two more Arco pictures. These are photos of Numbers Hill. 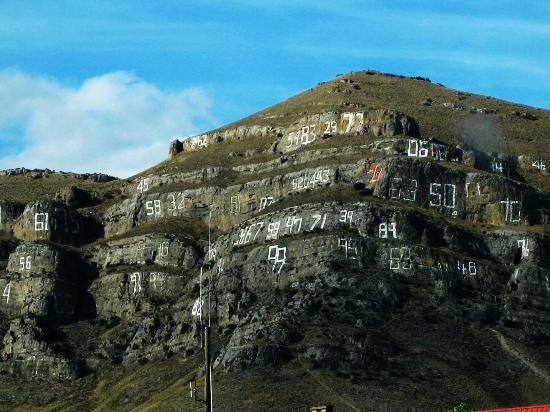 Every year since 1919, high school seniors have painted their graduation year on the side of the hill. 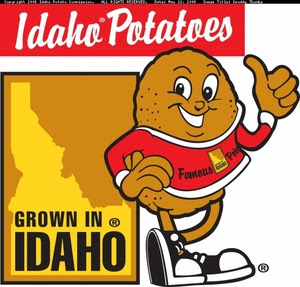 Idaho is well known for its potatoes, and we are definitely in Potato Country. 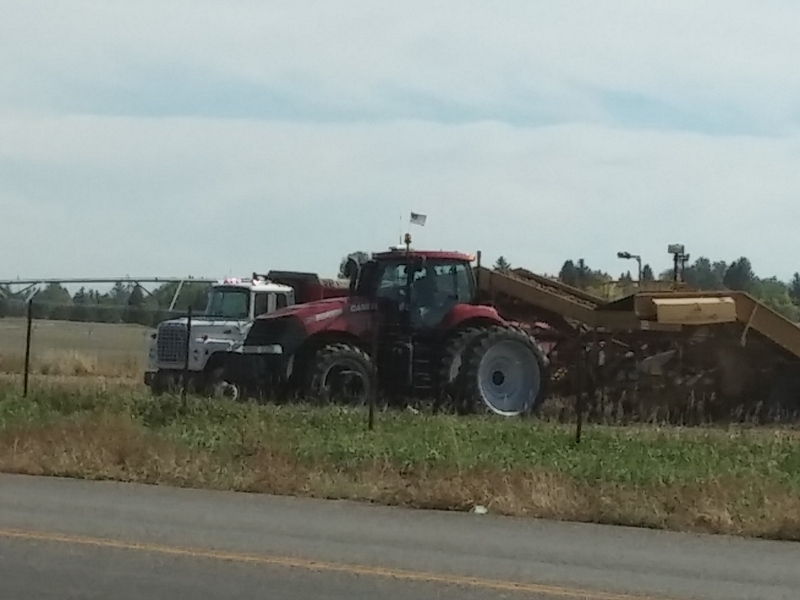 We watched some harvesting in Ashton the other day, and yesterday we watched some more in Idaho Falls. We think that two tractors dig potatoes up as they go down the field with four untilled rows between them. 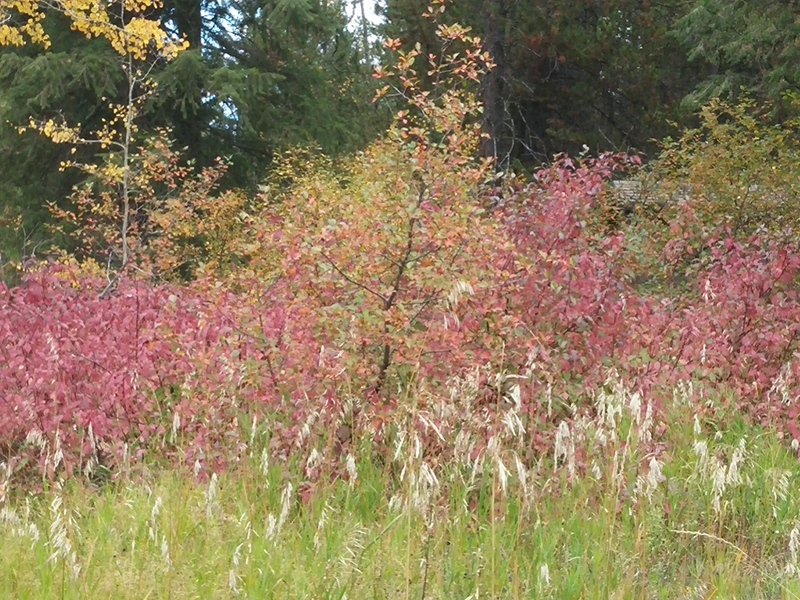 They each cover about six rows, and they pile their harvest towards each other. Then there is another larger tractor that digs the four rows that separated the tilling tractors. It then picks up the tilled potatoes from all sixteen rows. This larger tractor has a conveyer belt that dumps the potatoes into dump trucks or semis. We were astonished at how many potatoes were harvested for the amount of ground covered. The potatoes were at least six inches deep on the conveyor belt, and the tractor was moving s-l-o-w-l-y. 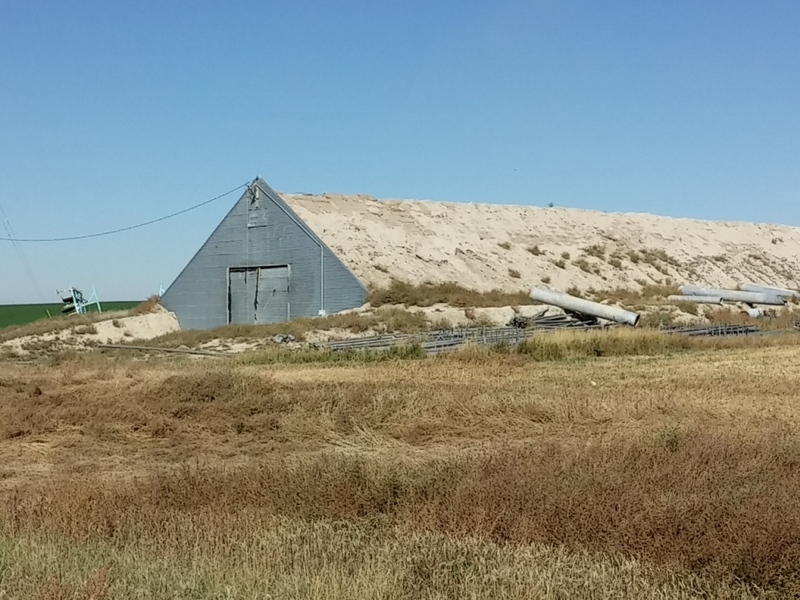 Most of the older farms still have potato sheds on their property. Potatoes, potatoes, potatoes as far as the eye can see. 300,000 acres of potatoes are grown each year. 11 billion pounds of potatoes are harvested each year. Those 11 billion pounds would fill 500 NFL football field stadiums. Many schools close for two weeks for Fall Harvest so kids can help with the potato harvest. 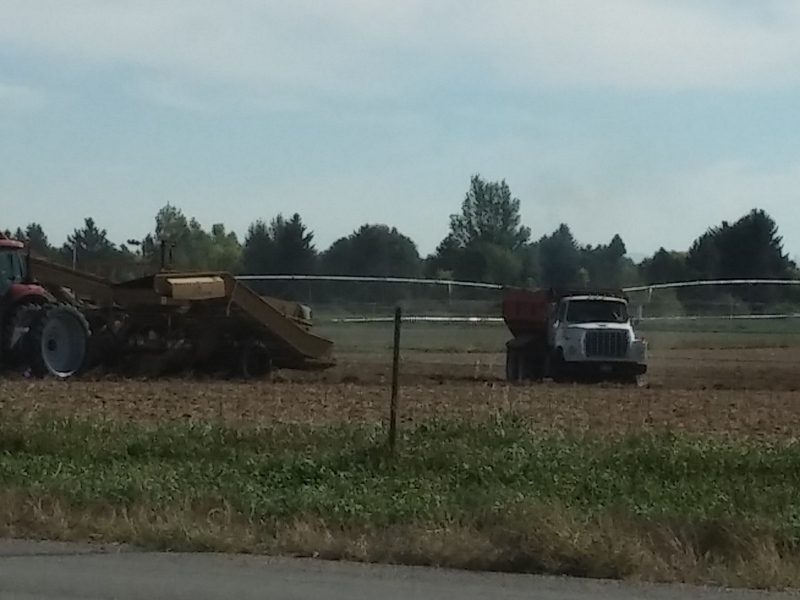 Idaho grows about 1/3 of the total US fall potato harvest. New York state uses the most Idaho potatoes. 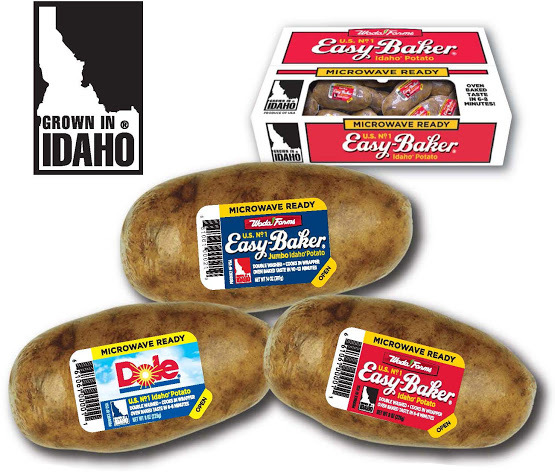 Idaho’s rich volcanic soil, cool nights, and warm days help make their potatoes the best. 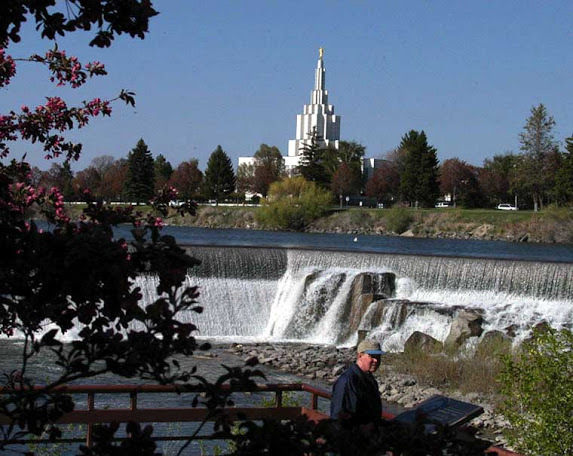 We are staying in Idaho Falls for two nights waiting for my medication to come. 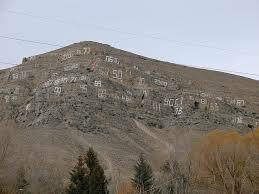 Then we will be off to the thriving metropolis of Arco, Idaho. 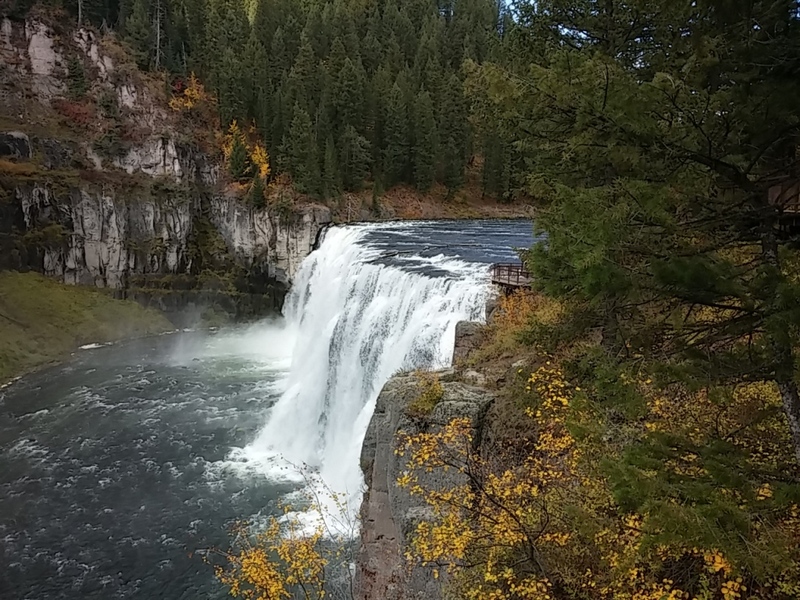 After looking for pickleball (alas I haven’t been able to play since Sheridan, Wyoming), the next thing I look for is a river walk or running trails in each new place we stay at. While I love waking and jogging, I hate being around cars while I do it. I’ve been pleasantly surprised at the number of communities that have dedicated places to go for a stroll. And even more surprised at how many people use them. PS All path photos are of places I’ve jogged, but photos were hijacked off of the Internet. 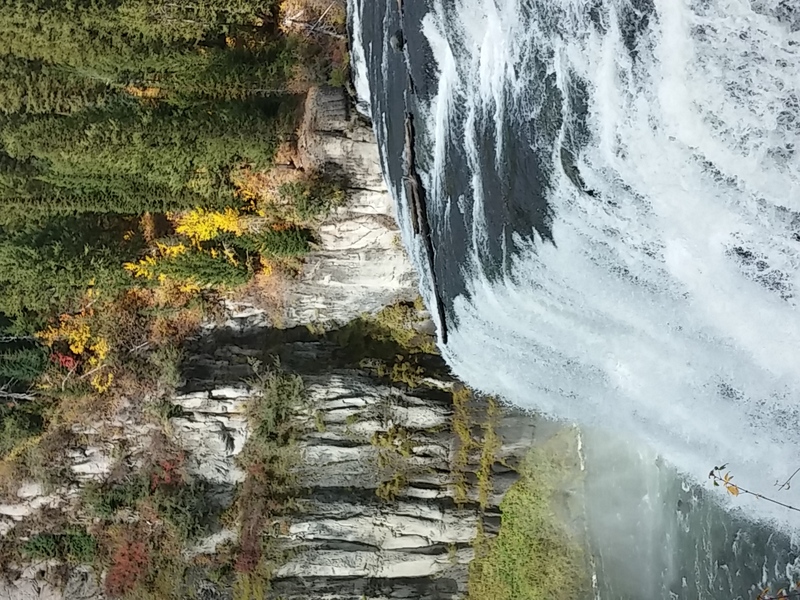 Mesa Falls Scenic Byway is a stunning 28 mile drive in south eastern Idaho. 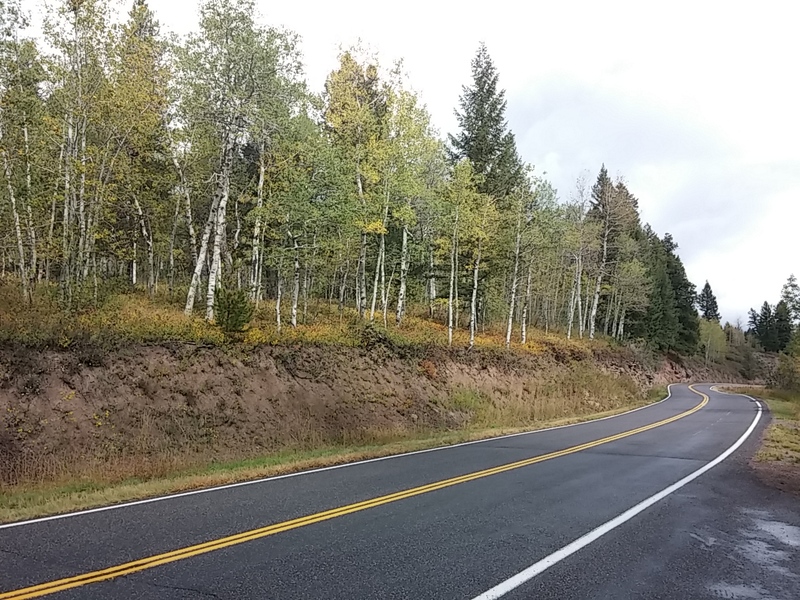 We’ve been on the drive several times, most often when we used to drive up to visit Richie when he was in college in Bozeman, Montana. Yesterday was our first drive just past the peak fall colors period. 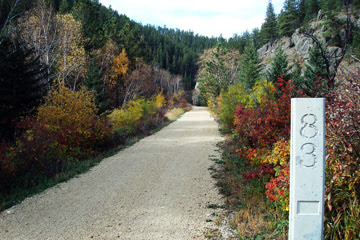 Originally the drive was a popular path to Yellowstone National Park. 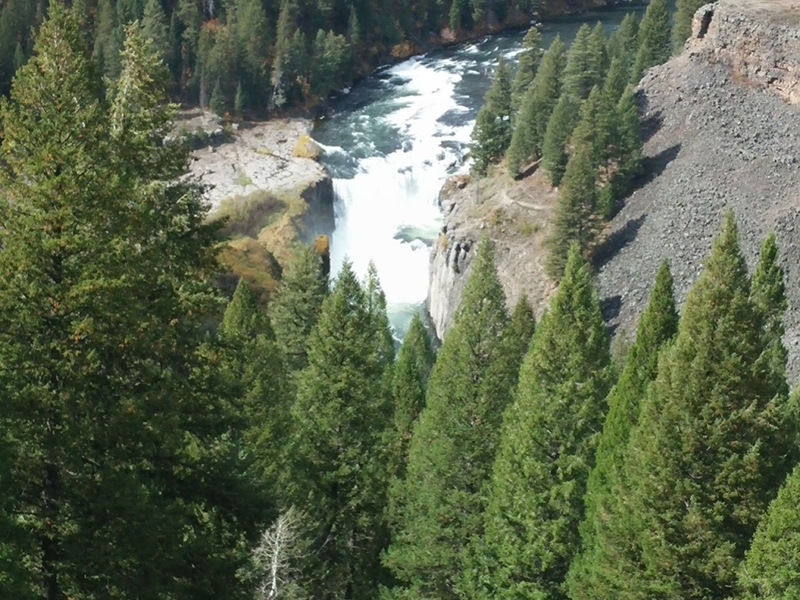 It travels along the Henry’s Fork of the Snake River. 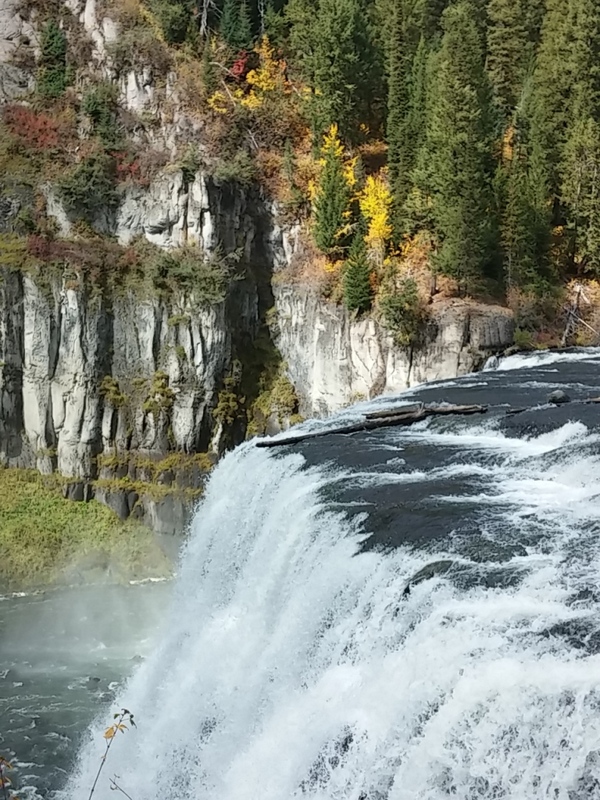 During the high early summer runoff, 2.5 billion gallons of water pass over the falls each day. So far we’ve stayed in Homer in seven states: Idaho, Oregon, Washington, Montana, North Dakota, South Dakota, and Wyoming. By the end of the year, we plan to add two more: Utah and Arizona. It has been interesting to see how different each of the states are in how and what they communicate. What is our state about? Motto: Oregon — She flies with her own wings. 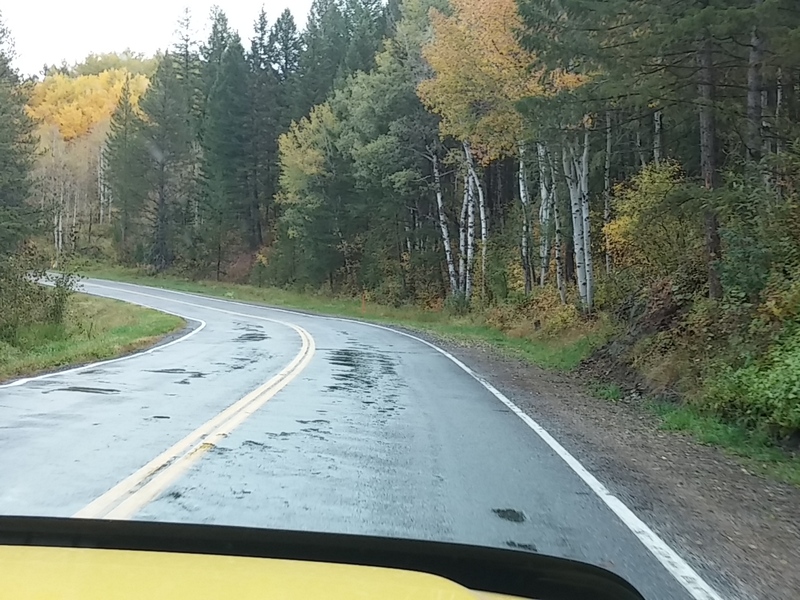 How Can We Make Drivers Pay Attention? 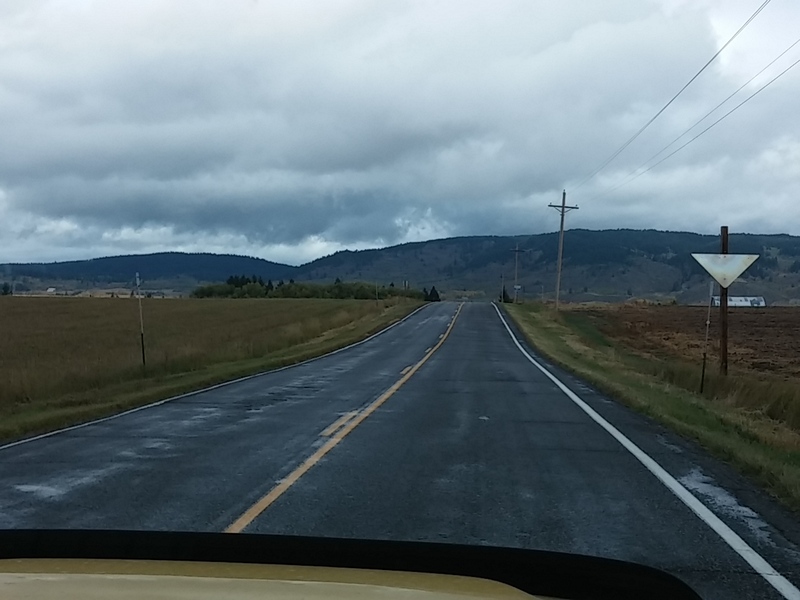 Over the last few days, we’ve taken four drives through the Lamar Valley to view wildlife. And on each of those days, we’ve seen scores of people waiting patiently to view wolves. We joined some other lucky people one morning and were very lucky to be able to see a lone black wolf jogging up a hill. We were close enough to see him without binoculars. Others on a hill close by were trying to get a peek at wolf cubs that had been seen the day before in that particular spot. 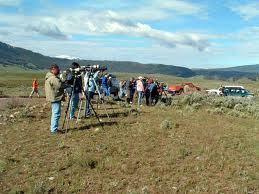 And everyone there was very kind and shared telescopes and binoculars. I’ve seen wolves before, so while I was happy to see them I wasn’t as HAPPY to see them as most of the people there. Most of the people were euphoric at their sighting. Wolf sighting hunters are a special breed. Almost fanatical in their dedication to see a wolf. They will wait hours in pouring rain, patiently glassing a dead buffalo in the hopes that maybe a wolf will stop by. And if two wolves show up, they are ecstatic. 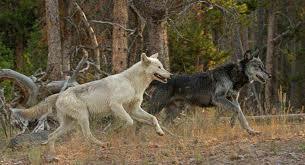 Many of the wolves are tagged and numbered. 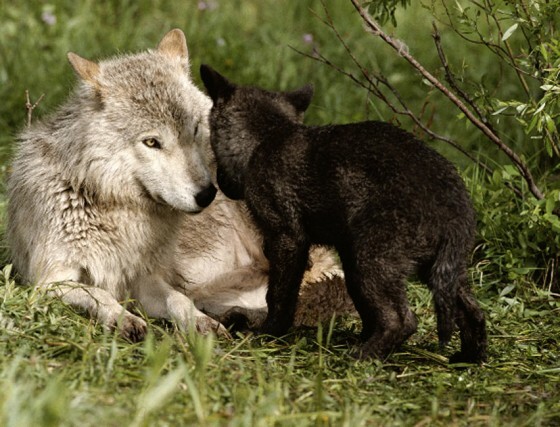 Wolf people know the number of the wolf they saw and whether that wolf is the alpha male, a male who is high the pack but does not mate, a female…. Their passions and knowledge are astounding. I watched a husband and wife hug each other and cry over their wolf sighting. I’m happy their trip to Yellowstone provided them to reach their dream. PS None of these wolf pictures are mine.